PRO: The gerbil’s tiny stature makes it a manageable size for children’s hands. CON: Like all other miniature mammals, gerbils are nervous creatures that will escape at any chance they get. Gerbil cages must be escape-proof, or plan on having to replace your pet. PRO: Gerbils are active during the day, are hearty, and rarely bite. This makes gerbils as pets a great idea for kids who might not have much experience with caring for animals. 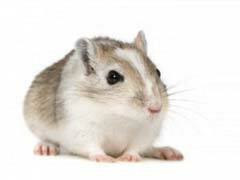 CON: Gerbils suffer from poor eyesight and you will have to be extra mindful of their safety when they are outside of their cage, playing with their gerbil toys. PRO: It’s fairly inexpensive to purchase gerbils and their pet supplies. A gerbil and its cage together might run you fifty bucks. Gerbil food might cost you a nominal fifty dollars annually. The most expensive part of owning a gerbil is its litter and bedding material, which may run you around two-hundred dollars a year. CON: Gerbils are very social creatures, so you may need to purchase more than one to keep your furry friend happy. As you can see, there are many reasons for why you may want to consider gerbils as pets. They make a great addition to any home, as they are small and easy to care for if you take the appropriate measures.